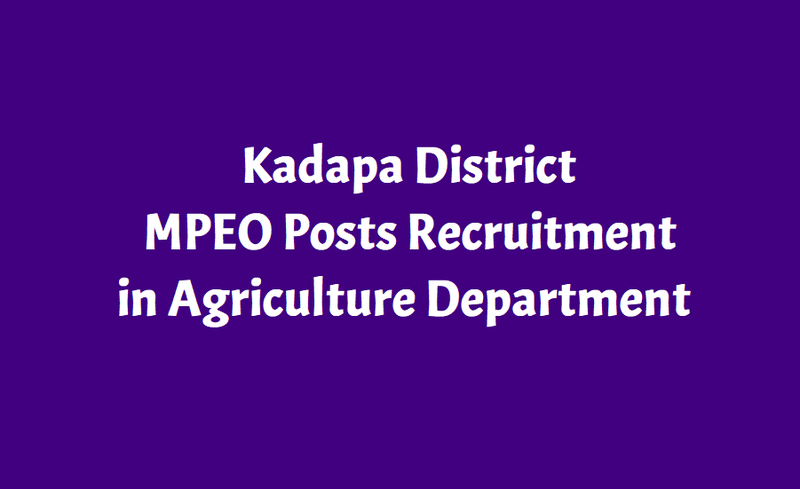 Kadapa MPEO Posts Recruitment 2018 in Agriculture Department: Agriculture Deptartemnt, Kadapa District has issued the MPEO Posts recruitment 2018 notification and Last date for submission of MPEO posts aplication form is 05.12.2018. Agriculture Deptartemnt, Kadapa District invites applications from the eligible and interested candidates for recruitment of Multi Purpose Extension Officers in Kadapa District on Contract basis. Age limit: Candidates age limit should have between18 to 40 years. Selection Process: Candidates would be selected Based on Degree marks, Interview. How to apply: Eligible and Interested candidates may download the application from the official website and send the filled in the application form along with required documents to the Joint Director of Agriculture, Kadapa, YSR District.